This is the vivid story of Logan Van Deveer, at one time owner of the townsite of the city of Austin, and who rescued from the Indians the fairest belle of San Antonio, whom he afterward married. Van Deveer was a hero of San Jacinto's bloody battlefield. The story also tells of a terrific fight with Indians in Burnet county. It is a story for all Texans to know, a story historically authentic and taken from historical records. Years and years ago, when Texas was indeed the wild and woolly West, and countless herds of buffalo restlessly roamed her prairies, when numerous Indian villages were hidden in the fastnesses of her purple hills, and San Antonio was but an overgrown country village compared to the wonderfully beautiful city it now is, there occurred one of the most thrilling incidents of that period. Within the confines of the historic Alamo City dwelt a beautiful girl, Mariel King, who reigned as belle in society. The charms of her sparkling personality and flower-like beauty drew people irresistibly, especially the male element. Though the Indians had frequently depredated upon the city, and many people were killed and many were captured, Miss King had had such a cordon of admirers for protection she had always escaped. Each day the redskins grew bolder in their attacks, however, and on one of their raids captured and carried off thirteen of San Antonio's inhabitants. The commissioners of the city decided that something must be done to rescue these captives, and realizing that this would be almost hopeless should they advance upon the Comanche settlement, and try to get them by force, fearing that in this instance the savages would murder them outright, they sent a messenger to bid the Indians come and smoke the peace pipe. "We have asked you here to smoke the peace pipe in our council chamber, and it would be a great pleasure to be friends with our red face brothers, but we can grant peace only on one condition: that you return the thirteen pale face captives which you have in your village." "When the moon appears in the east soon after the sun hides in the west, we will return our paleface captives, oh, my brother." When the moon had reached its full the Comanches came as they had promised, but brought only one prisoner. The same twelve chiefs entered the council chamber with their single captive, but on the outskirts of the town, bunches of their braves loitered, waiting to pillage and murder if the opportunity offered. "We told you that we would make peace if you would return the thirteen prisoners," the commissioner said sternly. "This is the only paleface we have, my brother. The others have flown to other lodges and other tribes," the Indian lied. "Oh, do not believe them" the captive cried, "they mean to bring in one at a time in order to extort more ransom money." Captain Howard and his ranger force had waited on the outside in fear of trouble. It was well he did, for scarcely had the Indians' prisoner ceased speaking when a chief sprang forward, sinking his knife in the side of the door guard. As the commissioner's shrill whistles summoned the rangers, Captain Howard was shot as he came through the door, being severely wounded. Desperate hand-to-hand fighting now ensued between the rangers and the Indians. Just outside the council room's open window a horseman sat watching the proceedings. As the rangers pressed the redskins closer, one husky chief leaped out of the window, landing behind the horseman, and throwing his arms around him, held him as in a vise, while his heels pommeled the high spirited animal's flanks, and sending him in a gallop around the plaza. "Shoot the damned red devil, quick, somebody!" The onlookers had watched fascinatedly each time the black horse with its double burden had charged by, but none had dared to shoot for fear of killing the white man in the crowd, however, stood Mr. Putman, at that time Texas' most famous shot, and as the horse tore by again, the crack of his rifle brought the chief a lifeless heap to earth. The rangers had now wiped out the traitorous bunch in the council room, and as Van Deveer left the city he came upon a wagon and the lifeless bodies of a man and a woman. Both had been scalped, and though this hardy frontiersman had frequently witnessed Indian atrocities, he swore a renewed oath of vengeance against the perpetrators of this fiendish deed. He rode straight on until he reached the Colorado river, following the trail of the savages while it was fresh, alone and undaunted, expecting to meet cunning with cunning, and after locating their village, to lead the rangers there in force and wipe them out. He found a woman's lacy handkerchief almost obscured by the leaves, and further on a bit of ribbon, which made him conclude the Indians had a female prisoner with them. With renewed vigilance he kept the trail. 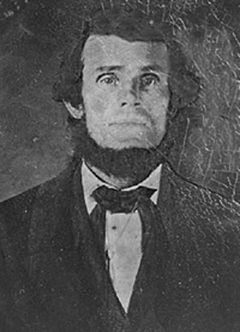 Logan Van Deveer was one of the bravest soldiers that ever carried a gun and fought for the Lone Star State. When the cry, "Remember the Alamo!" swept across the field of San Jacinto, Van Deveer was in the foremost ranks that struck the Mexican forces. Firing his old muzzle-loader at the nearest foe, he then brandished it above his head, becoming a veritable god of war, seemingly. Achilles in none of his Grecian exploits displayed more bravery and courage, nor wielded a sword with more telling effect than did this dark-eyed Kentuckian slay with his old gun. It was for these very telling blows that he received from the state a headright certificate for one-third league of land, part of which survey embraced the present townsite of the city of Austin. There was no man upon the plains that the Indians feared more than they did Logan Van Deveer. Of splendid physique, with black hair, and the most piercing black eyes, that were as brilliant as lightning, and with the strength of the hills in the ruggedness of his face, he made a noble figure in his deerskin hunting suit, mounted upon his black charger. With Captain W. H. Magill and Colonel Noah Smithwick, he held a contract with the government to furnish food to the Indians. It was hoped by this means to prevent attacks upon the settlements. The Indians, nevertheless, grew dissatisfied, and led by the fiercest chief on the plains, Yellow Wolf, they rode to murder the man in charge of the cattle. "You old yellow scoundrel! Call in your tribe and git' or I'll make hash meat out of you!" The chief quailed before the smoldering fires of wrath burning in Ven Deveer's black orbs, and overawed by the very boldness of his attack, obeyed his command. An Indian admires above all else bravery in his adversary, and ever after this they respected and feared Logan Van Deveer. The trail of the Comanches and their fair captive led on to Marble Falls, thence to Smithwick's Mill, where Van Deveer met Captain Magill and Colonel Smithwick, who were returning from a bear hunt. Explaining his errand, the three joined forces and pursued the savages into Backbone Valley, where the trail led directly to Sherrard's Cave (now known as Longhorn Cavern?). This cave is a miniature Mammoth, its main entrance near Burnet, one opening in the cedar brush some miles westward, and its outlet in Backbone Valley, ten miles from Burnet. The pursuers decided to try the opening in the cedar brake, as to offer them concealment while they investigated. Dark found them creeping on all fours to this opening. The smell of cooking venison greeted them; and they heard the hum of low voices, for the Indians felt secure in this underground fastness. The savages were squatting around a fire, preparing their evening meal, and a white girl, securely tied, leaned against the wall close by. Even in the dishevelment of her capture and subsequent journey with her captors, the girl was beautiful, and though her dark wavy hair hung in a tangled mass, her lustrous brown eyes held weariness with despair, she was still lovely enough to be the belle of the Alamo City. Each of the three men selected an Indian and a bullet went crashing into his brain. The Comanches, taken completely by surprise, and ignorant of the number attacking, fled in the dark passages of the inner cave. One big brave stayed behind, and with uplifted hatchet, was in the act of killing Miss King, when Van Deveer's big body bore him down, and the tomahawk meant for the girl was buried in the Indian's skull mid the feathers of his war bonnet. The Indians soon discovered there were only three men to fight, and with blood-curdling war whoops filling the recesses of the cave, they charged upon the white men. With only the flickering rays of the dying fire to light them, VanDeveer and his companions fought like tigers. The oath of vengeance he had sworn seemed to invest him with superhuman power, and his long hunting knife drank the blood of the redskins again and again. With the agility of an acrobat he avoided the blows of their tomahawks; now crouching against the jagged wall of the cave, now lurching upon his foes; and often his keen knife found an Indian's heart. Magill and Smithwick were not laggards in the battle, but using their guns for clubs, they slew right and left. The white men had thus far kept Miss King behind them, and with their backs to the wall, had stood the Comanches at bay, but one chief was intent on getting the girl's scalp if he could not get her alive. As Van Deveer was in the midst of beating off three opponents, this chief darted in behind him, and clutching the girl's beautiful tresses, raised his scalping knife to cut them from her head. Van Deveer's eyes, however, seemed to miss nothing, and striking down his last foe, he sprang upon the chief and literally scalped him alive before he drove his big knife into his heart..
Sticking the dripping knife into his belt, Van Deveer now caught up the fainting girl in his powerful arms, and with Magill and Smithwick protecting his retreat, he climbed up the rocky passageway leading out of the cave, and soon reached their horses safely. Trusting to the darkness to make good their escape, and familiar with every inch of ground, over which they had often chased bear, the party made their way to the settlement, where Miss King found a home with Van Deveer's relatives. Of course the natural sequel to this rescue was marriage. Though Texas' heraldic roll glows with the names of Houston, McCulloch, Hays, Lamar, and Chevalier, which illumines the pages of her history with an effulgence of glory, she never nurtured on her bosom a son of more filial devotion or indomitable will to do and dare, or of more loyal patriotism than Logan Van Deveer, original owner of Austin, who now rests "on Fame's Eternal Camping Ground."